Lots of residents showed up Saturday to protest the addition of a 775-apartment complex in Rowland Heights. The protesters said the huge complex will add a lot of traffic congestion as well as other problems. Safe Communities Week will be observed in the Rowland Unified School District from March 30 — April 4. Schools will celebrate with speakers and activities. The week concludes with the Safe Communities Week Festival from 10 a.m. to 2 p.m. Saturday, April 4, at Rowland Heights County Park, 1500 Banida Ave. The festival will feature school, community and public service groups, whose booths will provide delicious food, entertainment and information about safety promotion. There will also be several prominent speakers. Those serving on planning committee include personnel from Los Angeles County Board of Supervisor Don Knabe’s field office, the Los Angeles County Sheriff’s Department, the Los Angeles County Fire Department, the Los Angeles County Parks and Recreation Department, Rowland Unified School District Safety and Drug Alcohol Tobacco Education Program (DATE), and Operation Safe Community, a non-profit community coalition. The Safe Communities Festival is chaired by Nancy Ballantyne and Heidi Gallegos. Plan to attend this annual community observance. Author Denise Hamilton will visit the Rowland Heights Library on Saturday, March 28, from 3 to 4 p.m. The Los Angeles crime and mystery novelist will discuss her novel “Jasmine Trade,” which takes place in the Chinese-American community in the San Gabriel Valley. Hamilton will also bring her other novels for the book signing. There will also be a question and answer session. The library is at 1850 Nogales St. For details, call Rama Shah at (626) 912-5348. 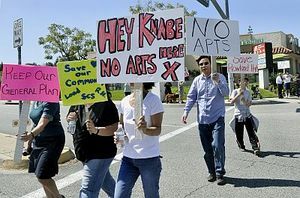 Residents in Rowland Heights will be protesting a massive apartment complex on Saturday from 11 a.m. to 1 p.m.
A 775-unit apartment complex is proposed for the site of Southlands Christian School and Church. The protest will be at the school located at 1920 S. Brea Canyon Cutoff Road. For more information contact Him Djuhana at himd1@yahoo.com. To celebrate Lent, St. John Vianney Catholic Church will present the play “People of the Passion” by Mary Betten at 7 p.m. on Friday, April 3, in the church at 1345 Turnbull Canyon Road. The production is free and open to the public. The play presents the personal stories of Gospel characters who witnessed the crucifixion of Jesus and were changed by the experience. It is staged in a reader’s theater style. Susan Boulanger is the director. The children’s choir will perform, along with some audience participation on other songs. Christine Brydges leads the children’s choir, while Michael Gribshaw is the accompanist. The actors include Manny Carrillo, Patrick Flanagan, Letycia Gomez, Veronica Lopez, Carlos Pacheco, Celia Rios, David Shephard and Jeannie Shephard. The Homestead Museum’s very popular Curator Camp returns on March 28 and April 18. Children in the fourth through sixth grades can spend the day working behind the scenes with curators on fun projects. Participants will also investigate corners of the museum that are not usually accessible to the public. The camp will be held from 9 a.m. to 3 p.m. at the Museum, located at 15415 Don Julian Road. The $20 fee includes a Junior Curator T-shirt, a take-home conservation kit, lunch and more. Class size is limited. For information or to secure an application, call (626) 968-8492 or visit www. homesteadmuseum.org. The Rowland Heights Library will be hold a book sale on Saturday from 10 a.m. to 4 p.m. in the lobby. They will have children’s fiction and non-fiction books, young adult books, adult fiction and non-fiction books, books on tape, and VHS movies. The American Red Cross and Rowland Heights Library will also offer community disaster education from 2 p.m. to 3 p.m. on Saturday. The free program will teach families how to make a emergency kit with food, water and other vital supplies, as well as an emergency plan for the whole family. The library is at 1850 Nogales St. For more information, call (626) 912-5348. The Hacienda Heights Library will hold a Spring Art Spectacular for families on Saturday at 2:30 p.m.
Art materials for a variety of spring-themed projects will be available in the meeting room at the library. Kids ages 3 and up can come and make one project or several. Light refreshments will be available. This program is sponsored by the Friends of the Hacienda Heights Library. St. Elizabeth Ann Seton Catholic Church in Rowland Heights will host a Jog-a-thon from 9 a.m. to noon on Saturday, March 21. This annual fundraising campaign takes place at Alvarado Intermediate School and is sponsored by the Knights of Columbus and the Office of Religious Education. Ten percent of all donations will be given to charitable organizations. The remaining funds will be used to pay for operating expenses of the Religious Education Center. Those wishing to support this effort can contact the church at (626) 964-3629. Auditorium for Hillgrove Community Center? “It is fitting that the meeting to receive input for the Hillgrove Community Center in Hacienda Heights be at a high school. “All four high schools in the Hacienda La Puente Unified School District have one thing lacking: a decent auditorium for performances by fine arts groups. Hacienda La Puente USD can brag about having some of the finest bands, dance teams and choirs but have no place for them to perform. I watched at least two plays take place outdoors in the quad at Los Altos High School. What’s your suggestions for the new community center? Leave us a comment.